Imelda Remedios Visitación Trinidad Romuáldez-Marcos (born Julie 2, 1929) wis an First Lady o the Philippines as the wife o Preses Ferdinand Marcos frae 1965 tae 1986. ↑ Rowan, Roy (March 29, 1979). 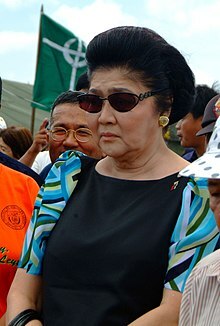 "Orchid or Iron Butterfly, Imelda Marcos Is a Prime Mover in Manila". People Magazine. Retrieved July 23, 2006. This page wis last eeditit on 11 September 2018, at 00:20.